The new formula Coochy Cream is now paraben free. Look for the new bottles for the new formula as show to the right. This is a very popular shaving cream for pubic hair for both men and women. Appropriate for use on legs, underarms, pubic area, face, and body. Coochy is also a great moisturizing conditioner that softens even the coarsest facial and body hair. It is a fabulous hair conditioner after shampooing too. 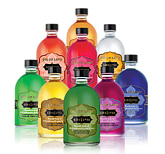 Original Fragrance: has an alluring array of light florals with a hint of baby powder freshness. Floral Haze Fragrance: Let go and discover the hidden beauty of floral haze. Infused with a seductive blend of rose, jasmine & delicate fruit blossoms, you'll want to ride the wild delights of this enticing fragrance. Green Tease Fragrance: Slip into sensual serenity with green tease. Infused with a soothing blend of green tea, bergamot and a twist of lime, you'll want to lose yourself in the succulence of this fragrance. Frosted Cake Fragrance: Island cane sugar, butter cream & Madagascar vanilla bean to release the memory of freshly frosted vanilla cake. Island of Paradise: Escape on an exotic adventure with island paradise. Infused with juicy acai berries & sensually sweet mangosteen, you'll discover and uncover the many wonders of this fragrance. 12.5 ounce tube. Sweet Nectar: Drink up the many pleasures of sweet nectar. Infused with a medley of pear, wild berries & apple blossoms, you'll savor the endless explosions of this fruity fragrance. 3.4 ounce tube. If your hair is long, you may want to first trim the hair down. You can safely do this by using the shortest guard with hair clippers or placing a comb flat on the skin and trimming over the comb with scissors. Take a warm shower or bath and begin shaving at least 5 - 10 minutes in order to allow the heat and steam to relax the skin and hair; which makes the hair easier to remove. Exfoliate (removing dead skin cells) with a gentle scrub brush or loofah sponge before hand in order to get a closer shave. Do not over scrub as you do not want to irritate the skin. Apply the shaving cream to fully cover the area you wish to shave. Using shaving cream moisturizes and creates a barrier so that the razor glides, instead of drags against the skin. This helps prevent razor rash, irritation and ingrown hairs. Shave with a fresh blade and go in the same direction of hair growth. For a very close shave you can then also go in the opposite direction of the hair, however, this may make you more prone to ingrown hairs. Therefore, you will need to see how you do one time in order to see if this method works well for you. Rinse the blade from the front back and sides between strokes as a clogged razor will not remove hair well. Rinse to remove all the hair and shaving cream when done and pat dry. You can put a light paraben free oil on afterward such as Earthly Body's Oil with hemp oil for a soothing effect. My friend had purchased the new formula Coochy Cream and loved it so I first got the Pearberry. I felt that it gave me a nice clean shave and my skin felt very soft after using it. It did seem to reduce the red bumps that I got, although I still had some, which I used Miracle Oil on and that was amazing. It allowed the razor to slide across my skin more smoothly without some of the normal drag that you can feel without it. I gave some to my friend to try and she said it made her feel itchy. However, she has very sensitive skin and I don't so for those with sensitive skin, you may want to try a more gentle brand like the Earthly Body or the Sliquid lines or start off with a small size to make sure it is a good match for your skin. I just really like the scents and just tried the original which is also very nice smelling. The one thing I noticed is that you have to really rinse off your razor well as the residue tends to stay behind on the blades. The old bottles that look like the picture to the left have the old formula in them and contain toxic parabens. We recommend that you do not use them.